Severe droughts are gripping much of the nation. More than 30 percent of the nation is experiencing at least a moderate drought, making this one of the most severe water shortages in American history. Conditions in seven states are so severe that each has more than half of its land area in severe drought, according to data from the U.S. Drought Monitor. In an interview with 24/7 Wall Street, U.S. Department of Agriculture meteorologist Brad Rippey said the drought has been a long-running issue. 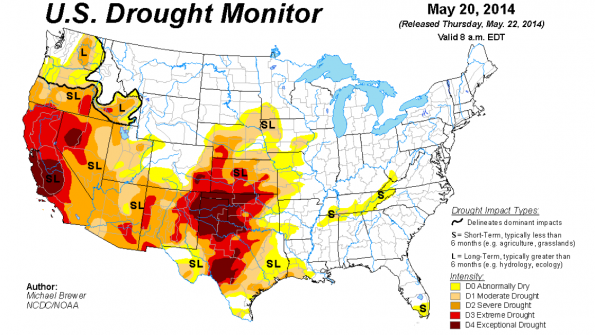 “This drought has dragged on for three and a half years in some areas, particularly in North Texas,” he said. In California, several water districts have been forced to pump ground water to serve communities, according to NBC Bay Area. In February, President Obama released more than $160 million in federal aid for the state, according to the Huffington Post. According to the University of California’s Davis Center for Watershed Sciences, the economic impact of California’s drought on the agricultural sector this year alone has been approximately $1.7 billion, along with “substantial long-term costs” of groundwater overdraft that has gone unaccounted for.